The 1965/66 season started in controversy as rumours circulated that a number of players were refusing to sign for the club due to the cancellation of the Whitsuntide Continental Tour. This was vehemently denied by the Clubs committee and they stated that they were not aware of any playing not willing to sign for the coming season. However, by the start of the season Albert Clapperton, Bob Thursby, Barry Storey and Dan McCourt had all left the club. Crook again reached the 1st Round of the FA Cup but unfortunately lost out to Gateshead 4-2. The 1968/69 saw the season saw the club begin the season with a friendly against a full strength Manchester City side who had supplied the new floodlights from their training ground. The game ended with Man City running out 6-1 winners. A disappointing season ensued with Crook finishing 11th in the league. In 1969/70 the glories of Wembley appearances and trophy wins was now a fading memory and the fortunes of the club waned dramatically and the season ended with Crook 2nd off bottom in the Northern League their lowest league position since the 1938/39 season. 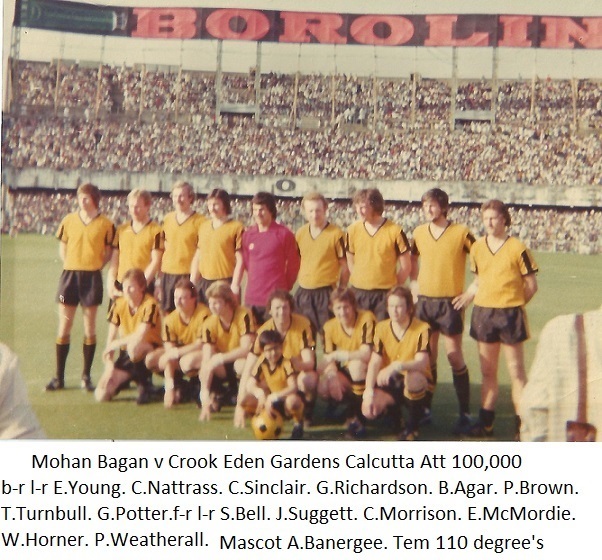 in 1970/71 the club continued to struggle both on and off the field. Results faired little better from the previous season and the club found themselves in another re-election battle. Boardroom squabbles over who should select the team also hampered the club. 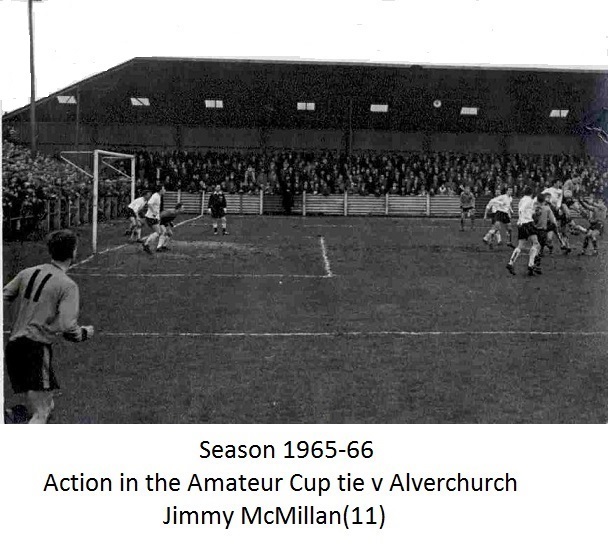 The fortunes of the club since their last FA Amateur Cup win in 1964 had now dramatically taken a down turn but supporters could seek solace in the fact that fortunes just up the road at old rivals Bishop Auckland had faired little better and they too were in the midst of a re-election battle themselves. The two once great clubs who not only battled for Northern League supremacy in the 50’s/60’s but also for national supremacy were now both shadows of their former selves and both narrowly avoided re-election. 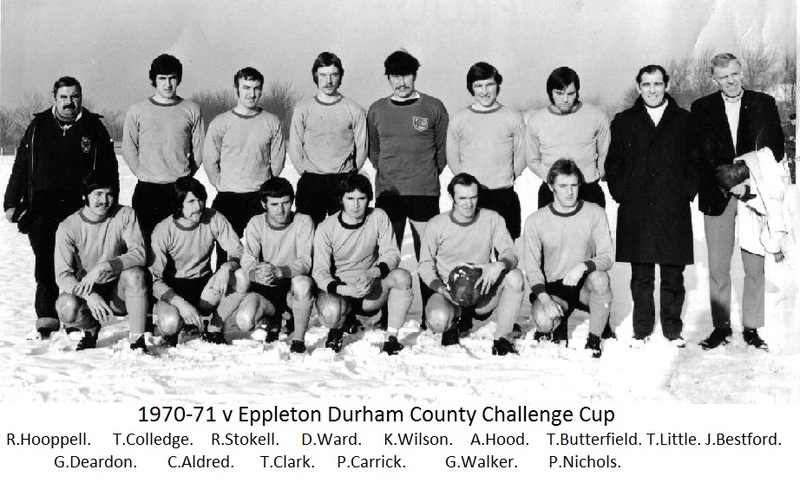 At the start of the 1971/72 season, little seemed to have changed off the field. In an extraordinary committee meeting the club voted in favour that the Manager would no longer be responsible for team selection. A number of committee members resigned over this decision. Due to the lack of cup runs and success in previous years the club were also experiencing financial difficulties. Indeed they started the season with a deficit for the first time since the 1930’s. The club continued to struggle in the next couple of seasons and little of note was achieved and their seemed to be constant in fighting between the committee and the teams Managers. In the 1974/75 season team manager Davis Carrick resigned stating the his position was now untenable due to the fact that he had gained the knowledge that the committee were already seeking to replace him. 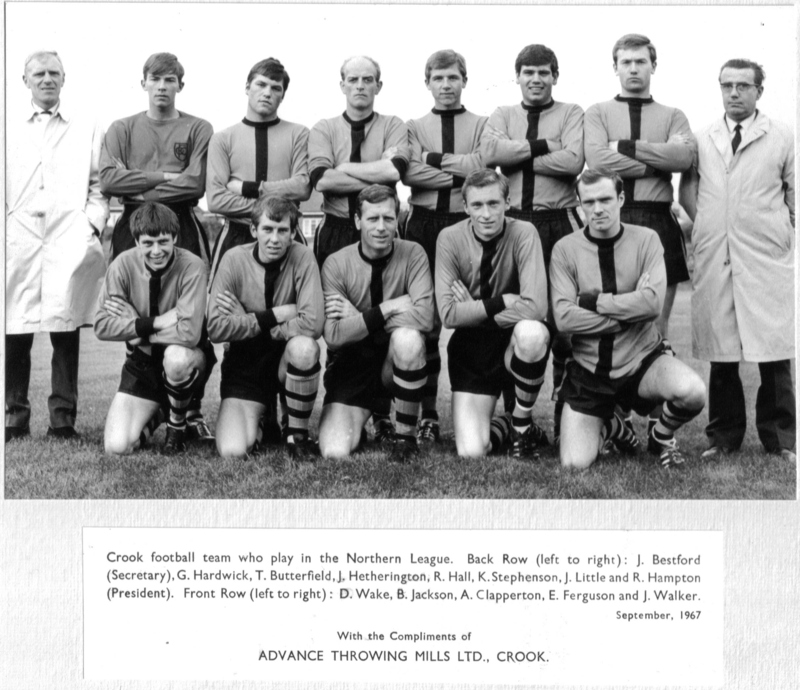 On a positive note Crook Town now had a reserve team playing in the Auckland and District League which was formed from the now defunct Crook Electric. 1975/76 was a summer of activity as August saw preliminary talks held regarding a possible tour of India. 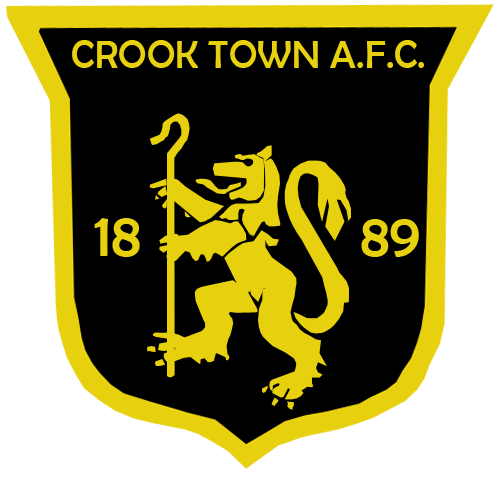 Crook went in to the season with a new management team and virtually new squad and hopes were high regarding the new season. Rothmans who were now the league sponsors were offering a unique opportunity to member clubs by stating that they would pay a bonus of £40 to any team who could win a league game by 4 clear goals. Crook cashed in on their first bonus beating Ferryhill away 5-1. However, With Crook Town, controversy was not far around the corner. Mid way through the season new Manager, Ron Heslington resigned his position stating a difference of opinion with the clubs committee. Crook again finished the season at the wrong end of the table narrowly avoiding re-election on the final day of the season. 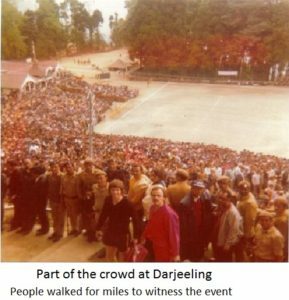 1976 saw the club embark on a remarkable tour of India which owed a lot to the then club doctor, Dr Banerjee. The tour however nearly did not go ahead as the Indians had requested that either Geoff Hurst or Bobby Charlton from the World Cup winning side of 1966 would play in the games in order to ensure interest so expenses could be recovered. Bobby Charlton, after a series of meetings in Manchester, agreed to accompany the touring party but the whole tour was thrown in to turmoil when he pulled out at the last minute. 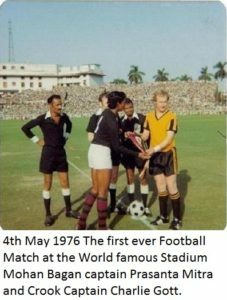 It was agreed that because all the preparations had been made that the tour should still go ahead and the touring party left Heathrow Airport and landed in Calcutta on the 3rd of May. 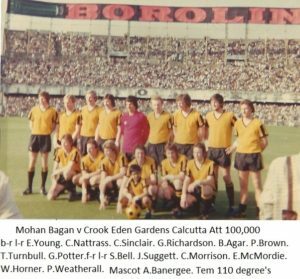 The tour was a roaring success with 100,000 turning out to watch the first game against Mohan Bagan which ended honours even with a 1-1 draw. The next game was in Darjeeling and the night before the game the players were treated to an evening of cocktails at the Governors mansion in Darjeeling which included many local dignitaries including the British Ambassador. The tour concluded with a game against the Indian National side which Crook lost 1-0. The tour was a roaring success and talks had already taken place regarding a return tour the following season. 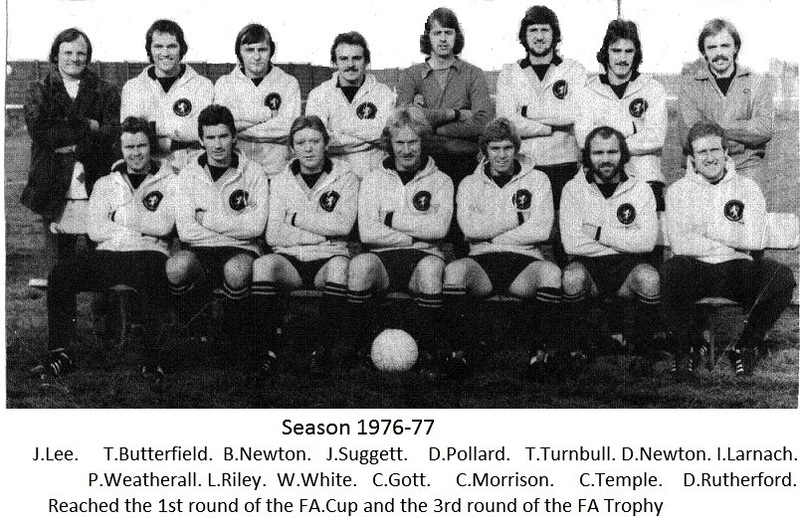 The 1976/77 season saw another change of Management with Brian Newton being appointed Player/Coach. He made a number of signings over the summer and the squad to start the season was looking much stronger than it had looked for some time. Indeed the early season optimism proved to be right as Crook again reached the 1st round of the FA Cup a feat which during the 50’s/60’s was a regular occurrence but had not been achieved for a number of years. Nuneaton were the visitors to Millfield for the 1st round tie but unfortunately past glories could not be reignited as they lost 4-1 in front of a crowd of 2000 the biggest seen at Millfield for a number of years. The same season, after the disbanding of the FA Amateur Cup, the club were now playing in the FA Trophy. They managed a very good run making to the 3rd round but unfortunately lost at Slough Town after a replay. League form had also taken an upward turn with the club finishing in a respectable 4th position. Their best for some time. 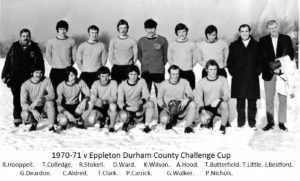 The 1977/78 season started with a renewed optimism as building on the back of a relatively successful previous season hopes were high in the town that Crook could now start re capturing former glories. 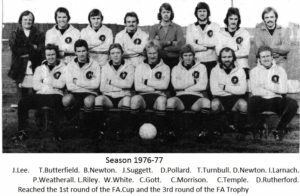 Things started promisingly as the club again started well in the FA Trophy and on the 14th January they met Blyth Spartans who were in the midst of their Heroic FA Cup run that season reaching the 5th round. However, on the day Crook pulled of a remarkable result winning 2-1 when Blyth had dominated the majority of the play. In the next round Crook played Dagenham who had appeared in the final the previous year and had 32 professionals on their books and were regularly playing in front of crowds of 2000/3000 but could not match the heroics of the previous game and went down 4-2. The League form of the previous season could not be maintained and the club finished in a disappointing 10th position. The 1978/79 season was one of slight disappointment by the previous seasons standards but could have been due in some part to the horrendous winter that was experienced that season. An FA Cup tie with Bishop Auckland was cancelled a remarkable 20 times before being played but a creditable league position of 4th was achieved. 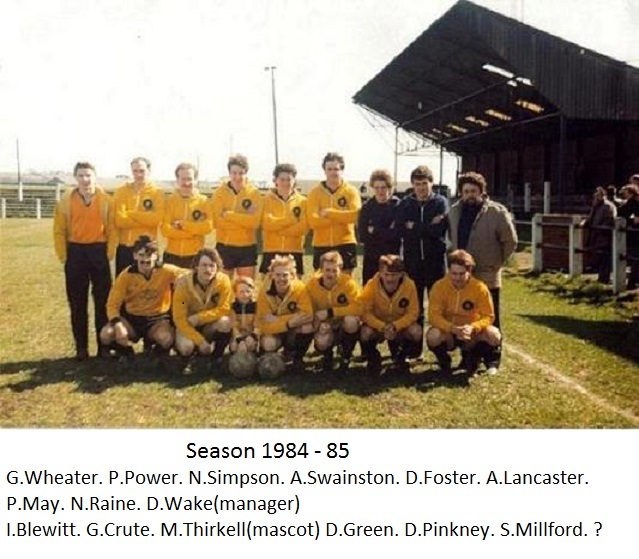 The 1979/80 season saw Crook maintain their league form finishing in a creditable 5th position level on points with Ashington who finished 4th on goal difference. However, their were no cup runs of note and it was widely felt that for the club to kick on to the next level a financial injection was need. At the start of the 1980/81 season the club were taken aback with the shock announcement that Brian Newton had excepted the managers position at local rivals Bishop Auckland taking a number of players with him. Ian Lanarch was appointed team manager but due to a poor start he did not see the season out. Crook struggled that season and found themselves back at the wrong end of the table finishing in 3rd bottom. It was stated that all the progress achieved under Newton had now been lost. The 1982/83 season saw the introduction of a 2nd division in the Northern League. 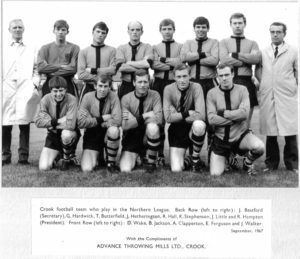 Crook made it all the way to the semi final of the league cup where they were due to meet 2nd Division Norton. It was widely expected that due to their higher status and Norton having a poor season in the 2nd Division that Crook would indeed make the final but Norton pulled of the shock of the competition by beating Crook and progressing to the final where they went one better defeating Whitby Town to lift the Trophy. Crook finished in 10th spot in the league which was a slight improvement on the previous season. The 1983/84 season once again saw the club in turmoil. Due to a poor start, manager Les Hood was sacked and was replaced by Clive Nattrass. Results did not pick up and Nattrass was to relieved of his duties before the seasons end. The club were now in serious danger of slipping in to the 2nd Division however they rallied towards the end of the season posting some good results against both Spennymoor and Bishops respectively and narrowly avoided relegation by 1 point.